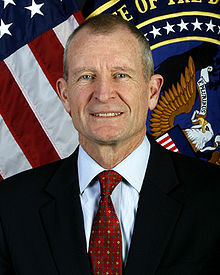 Dennis Cutler Blair (born February 4, 1947) is the former United States Director of National Intelligence and is a retired United States Navy admiral. He was the commander of U.S. forces in the Pacific region. Blair was a career officer in the U.S. Navy and served in the White House during the presidencies of both President Jimmy Carter and President Ronald Reagan. Blair retired from the Navy in 2002 as an Admiral. In 2009, Blair was selected as President Barack Obama’s first Director of National Intelligence, but after a series of bureaucratic battles, he resigned on May 20, 2010. ↑ "Blair, Dennis C.". Current Biography Yearbook 2010. Ipswich, MA: H.W. Wilson. 2010. pp. 46–50. ISBN 9780824211134. ↑ Bob Woodward, Obama's Wars (New York: Simon and Schuster, 2010), p. 371. Obama offered Blair the opportunity to devise a face-saving cover story, but Blair refused: "You want me to lie?" This page was last changed on 5 March 2017, at 10:58.